I am advertising for an online class that I will be leading. The advertisement will be distributed strictly online. I am attaching a sample brochure titled "QPS Accelerator..." I like the feel of her brochure so please use it as a guide. 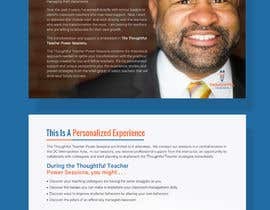 Feel free to view my website at www.thoughtfulteacher.org. I will attach files of my logo and pictures. Use them as you see fit. The logo must be included. The ad copy that you will be using to create the ad is the last file title "Thoughtful Teacher ad copy". If you have questions, do not hesitate to ask. Have the colors complement those on my website/logo. Thanks. what is the size of brochure?